Anyone who holds up Europe as a model either hasn't been there or wore rose-colored glasses on their visit. What I saw was lots of people with no car, tiny cars if you have one, crowding, old buildings, no suburbs with yards. Just kind of tired and sad. Great museums, but you can't live in a museum (oh, wait, they do!). Don't overindex on the car thing - a car is much less useful in most desirable locations in Europe; public transport is great (sufficient density and cycle times, wouldn't work in the US). You've got more cultural sites on offer, more variety in food and entertainment. Personally, I find the house + garden combos in Germanies suburbs vastly preferable to the ones in the NW US, but it sounds like you are comparing to city style living. The general environment feels more safe and less litigious to me, and much better administered. Well Coyote, if you only tell half the story it is easy to reach the wrong conclusions and understand the moral of the story. So let's dig a little deeper into this story and the data.
" In fact, not only are American rich richer, but the American middle class is richer and the American poor are richer. From an earlier post, here is the purchasing power of individuals across the income spectrum in the US vs. Denmark"
"So the data had to be there somewhere. Finally I found a set of data that seemed to does the trick. I used data from the LIS Cross-National Data Center." These refer to government-provided services that benefit individuals, but are provided with the primary objective of meeting the general needs of the overall population, rather than that of assisting the poor. Specifically, we do not include non-monetary transfers in the areas of housing, care (including child care), education, or health. These transfers are very hard to evaluate at the individual level and thus are typically only available at the macro-level. Thus, the value of these transfers is also excluded from DHI and, these non-monetary incomes are not available in the LIS microdata." Translated into English and pertinent to the graph, this means that universal 12 month paid maternity leave, free child care, free schools (from kindergarten all the way to an university degree) and free healthcare are not counted as disposable household income. But I dare say it makes for an easier and richer life for everyone, including the poor. Everyone, including the poor, also have access to a subsidised public transport system that extends outside the inner cities. Again, it does not count as disposable income, but it makes life easier and richer for all. Also, how do you put a value on being able to live without fear? Without worrying about school shootings, worry about having to carry a gun 'just in case'. Can you put a value on being able to leave your sleeping baby outside a café or restaurant without fear of kidnapping or Child Services accusing you of child neglect? It is not random that Danes are often categorised as the happiest people in the world. It might be caused by a generous prescription of Prozac by doctors but I do not think so. I do think it is caused by leaving in a secure environment without fear of what is going to happen tomorrow. Just like in a prison. I've tried it and beg to differ. Even ideal public transportation will turn a 5-minute trip into a 30-minute trip, and will stop functioning after 1am and at limited times on weekends. The best possible public transportation is still only attractive if your time isn't valuable. Better off people Copenhagen, Geneva, Lausanne, or Aarhus have cars and use taxis, just like better off people in New York City. None of your links work. That makes me wonder how carefully your assertions have been researched. Well, not my fault that this discussion platform has a problem with parsing links. But if you could move your lazy fingers or mouse to the address bar and remove the trailing "):" I am sure you will be enlightened. I want to point out something in just one of your paragraphs to start. The one that starts, "Also, how do you put a value on being able to live without fear?" All the fear you speak of that we Americans have to worry about is fear that is constantly being reported on by "liberal" media, through liberal politicians trying to scare everyone into giving up their guns, or take away their freedoms. "Child Services" is a reflection of all that hysteria from the fear mongering and then liberal politicians giving them more and more power, taking that power away from the parents. Why do we have the term "free range kids"? Because the fear espoused from liberal mouths scaring every parent into having to be within arm's reach of their children 24/7. If you don't do as the government says, they will take your kids away from you. You also forgot to mention that nothing gets "invented" in European countries. Most technological advances are made right here in the US BECAUSE free enterprise drives innovation. Our medical cost are higher, partly because we develop new techniques and equipment that not having social medicine (so the dollars are not controlled by government) allow research and development money to be available. If the government dictates how money can be used in healthcare, none of it goes to companies to find ways to extend life. It's all about maintaining it, Some countries have just begun the "death lists" that were promised to never be an option. The "you're too old to get treatment" option was NEVER supposed to happen because the government promised it never would. But now, the conversation has begun in countries that are having a hard time funding their healthcare systems. I happen to like having disposable income to CHOOSE what I want to do. I own a car, so I can choose when and where I go. I don't have to rely on the "schedule" of public transportation. For those who do and are ok with it, I'm happy for you. But, I like the freedom to choose my own time and place. The claim that Danes are the happiest does not mean all that much when most of their life is dictated to them. I prefer making my own choices, not being told how to live. 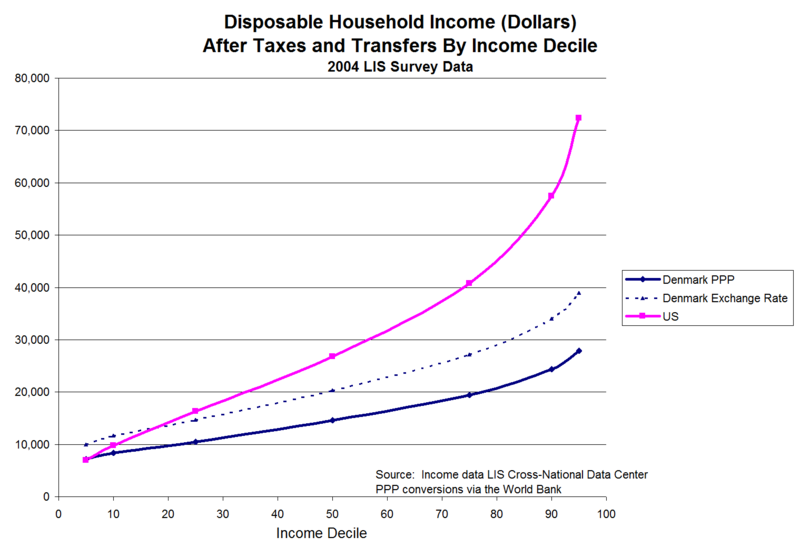 Taxes in those countries is extremely high and disposable income very low. I will choose freedom of choice over socialized life any day.